I want to thank everyone for the hundreds of smart comments on T.Boone Pickens and his wind/natural gas energy plan. By contrast, the Pickens plan generated precious little feedback from policymakers and others you'd expect would have a direct stake in this. Not a peep from the White House, nor the candidates, nor Congressional leadership. Virtually nothing from the business community, or from environmental groups. So let's keep our part of the bargain, and continue this great discussion. Today, President Bush is addressing another part of the Energy Hunt, by lifting a partly-symbolic Executive Order banning drilling off most of the U.S. coastline. Whaddya think? Is it long overdue? Or, as Pickens said, is it a problem we can't drill our way out of? Why are we letting history repeat itself. The outcome was not a happy one. We need to start using Algae. NOT CORN to start fueling out vehicles and powerplants. 1) sequestering carbon is stupid, ALGAE will convert all those polutants into oil that can be processed into fuel and oxygen. 2) Using corn is stupid, ALGAE has over 1000X the amount of oil than corn does. Plus, We would have food. 3) We need to start taking the pollutants out of the Air, not the ground. We can use global warming as a plus in terms of ALGAE growth. We can not only harvest the energy in the pollution of the air, but start storing dead algae where we've been taking coal and oil out from. WE CAN REPLENISH OUR OIL SUPPLY THIS WAY! Provide results and answers CNN. You guys need a whole environmental Tab on your website. This is the most important thing of our lives. WIthout a livable environment we will have no money, no politics, no gossip. Straigten up. Of course no one is listening.... especially the politicians. Doing so might exposes the fact he (Pickens) has much more insight and drive concerning the energy ( and frankly, American) policiy. I urge you ALL to wake up and realize that its the Political Parties (Democrat AND Republican) that are attempting to hijack this country. (Maybe they already got it....) Both parties are CROOKS. Both parties LIE and STEAL from YOU. Revolt if neccessary, protect our Country, but most importantly, VOTE INDEPENDENT. This doesnt only include the Presidential election, but Congressional and Senators seats too. Remove their ability to ruin your life and Country. America is crumbling and there is only one thing that save it. – The People. Wake up Americans, its time to stop being ignorant. Dont ignore the warnings of the World. Hold your politicians accountable. DO NOT VOTE DEMOCRAT. DO NOT VOTE REPUBLICAN. Thanks Dave. Here's a link to the algae story Miles O'Brien did several months ago. T. Boone Pickens is correct with his assessment that we can’t drill our way out of this problem. This is because the U.S. reached peak oil production in 1970 at around 9.5 million barrels per day (mbd) and has been in terminal decline ever since. When the Alaska North Slope came onto production, it added about 2.0 mbd by 1990, but because the production base, the easy oil in Texas and other places in the lower 48, was already in decline, total US oil production remained in decline. Today the U.S. is producing 5.5 mbd. (FYI – the U.S. is currently the third largest producer of oil). If ANWAR and the U.S. coastline were to be opened to drilling, the most optimistic scenario is that by the year 2028 we would have added 2.0 mbd to U.S. oil production. But because base production is still in terminal decline, in 2028 we might produce the same amount of oil as we currently are today (5.5 mbd) instead of a projected 3.5 mbd. And then the decline curve would take over again after 2028. Also, the main reason why oil has gone up do much in the last three years is that world oil production has stalled out at about 86 mbd. The only way to prevent shortages is for the market to raise the price of oil. The weak U.S. dollar doesn’t help either. However, the real question that all Americans, and really, the entire world should be asking is when a peak in world oil production will occur. There are many smart petroleum geologists who believe it’s happening now or within the next few years. There are others who believe it won’t happen for 20 or 30 years. Because most oil reserve data in OPEC is a closely held secret, we may never know until after the fact. A peak in world oil production will happen in the first half of this century. A peak in natural gas and coal production will happen soon after that. We have to avoid the traps of corn ethanol, tar sands, coal liquidification, and oil shale. All of these technologies require a huge amount of energy, natural resources, and many produce more pollution than current oil production and gasoline refining. Also the energy return on energy invested on these range from 4:1 for tar sands to even less than 1 for oil shale. And for corn ethanol, we are feeding our machine food which drives up the price for food. Bio fuels and other liquid fuels will need to be produced but only for aircraft (you can’t fly using a battery). What would happen if we don’t build a renewable energy infrastructure before oil, gas, and coal go into a steep decline? Would we be able to build it if we can’t keep the lights on in our homes and the supermarkets stocked with food? At some point we are going to have to move to renewable sources of energy. We live on a planet with finite resources. Oil, gas, and coal were a wonderful gift that allowed us to build the most advanced and complex civilization ever on Earth. But these hydrocarbons were a one time gift that will run out. In a 150 years hydrocarbon man will no longer exist on Earth. Will he adapt or go extinct? The world is two thirds water. The wind blows constantly across the plains. The sun shines constantly on the desert southwest. We have massive flooding along the great basin every year. Why not have the army core of engineers build a canal or via duct to bring those flood waters over the continental divide. Create a great body of water to use as power storage. Create electricity from wind and sun to move the water. When the wind isn't blowing or the sun is not shining the stored water could power generating turbines so that we have a constant source of energy.....all green...all american. Any excess water could be channelled to the desert southwest where it is badly needed. For once in my career I agree with Boone on something. I spent 20+years working in the energy business both the electric utility side and the oil and gas side. For the $60 billion /month we pay for imported oil we can build a grid that captures the wind of the High Plains and transmit it to the needed markets across the entire US. I note in the hearing at Austin on ERCOT's wind planning yesterday that there are whiners about reliability. Stanford's Civil Engineering Dept has done a paper that shows that, with sufficient geographic diversity, wind can be made more reliable than a conventional coal fired power plant. The cost does not include the construction of the wind farms themselves or the improvements that your neglectful grid operators have failed to make in the last 20 years at the behest of grossly negligent regulators who considered cost but not reliability. The most obvious impact is going to be on the coal oil and natural gas industries. I for one do not consider using compressed natural gas as more than a stopgap in cutting oil imports because we currently import more than 10% of our natural gas. It does offer a quick response to lowering CO2 and air pollution from cars, but in the long run solves nothing. We can use excess wind power to make hydrogen using available water and completely put and end to the CO2 and trade deficit problems that face us. You don't stop an alcoholic from drinking by giving him half a glass instead of a full glass. Nice set-up by CNN to bias the dialogue by showing a picture of an off-shore oil rig spewing black smoke as opposed to a $4.99/gal gas station...do we need to guess which side your on? I think the idea of opening up these areas for offshore drilling is complete showmanship (oh, and greed). This will in no way alleviate the current cost of oil, as it will be at least 3-5 years before the first barrel of oil is produced, and that's a best case estimate. In actuality the oil companies already have a huge area of available offshore locations for drilling, but they do not want to drill there because the waters are relatively deep, increasing their production costs. But considering oil companies only need approximately $45 a barrel to profit from standard offshore wells, I think they can certainly get by while absorbing the slightly increased cost of these deep water wells. It seems to me that Bush is doing what he's done his entire presidency, provide huge benefits to those that don't need it in the hope/expectation that he will be well rewarded in the future. ST has made a ridiculous point. 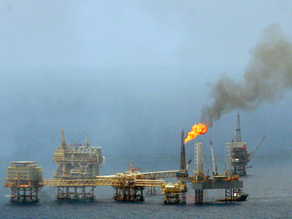 It doesn't show "bias" when we show a picture of an oil rig, doing what an oil rig does, in a blog post that's centered on an announcement on offshore oil drilling. A good example of a "biased" picture would be a bird soiled by an oil spill. That would be making a statement about the possible dangers of offshore drilling, because that's the argument of one side of this discussion. Another "biased" picture would be the one you suggest - one that just focuses on the price of oil. That would be siding with the argument of the other side. Its way long overdue. Its easy to blame the current administration but the American public has not been willing to insist upon a long term, comprehensive energy plan. Not when energy costs have been, up until recent years, been so low. Its simply been a problem that has snuck up on most of us. Rather than getting a few cents knocked off the price of gasoline, I'm much more concerned about the long term effects, 30 and more years out. What kind of future are we leaving our children when we use the last of our oil, still use seven times as much energy as the rest of the world, and have sent trillions of our dollars to dictators that don't like us. The wake up call is sounding louder and louder! 1) This IS a demand and supply issue. 2) However, supply can be increased 1000%, but until REFINING capacity increases, the amount of supply is worthless. 3) Financial speculators have very, very little to do with the price of gas. A) Some area must stand up and allow additional refining capacity in their "backyard". B) Minimum miles per gallon standards MUST be raised. C) People who buy new, gasoline powered cars at less than the Federal mpg standard should pay a hefty "pollution tax. D) Oil company royalty breaks and cheap land ($5 / acre) leasing need to be phased out. E) Car companies need federal loans, to be paid back, to re-tool their manufacturing lines for hybrid and electric car production much sooner than their current time table. F) Consumers need to hold their governmental leaders accountable. There was ZERO, NONE, ZIP dollars in the 2008 Federal Energy bill for solar, wind, battery or other non-petroleum energy sources. This is all a scam. Do you really think if they pump more oil out of the ground that they will not sell it to China and India? President Bush is criminally negligent president he has sold us all out. No,Pickens is an idiot living in a fantasy land that the American people can no longer afford.If these green technologies,(solar,wind,thermal,ethanol)were such great ideas and easily accomplished,one would think they would be used,not just here,but in other countries as well,but they are not.Why?Because they are the pipedreams of inventor types and have not proven to be viable solutions.It' s time to take our economy and well-being back,Opec has and is controlling our economy,like it would hurt the filthy rich arab Opec countries to just make a flat price reduction of $30.00 on a barrel of oil across the board,regardless of the specualators,then the world could get a little bit closer to normal.But no way they will do that, the arabs are running us into the ground and the only thing that will stop them is for us to drill for and refine more oil in a day than we use,coupled with building nuclear plants, we would no longer be controlled by Opec.VOTE McCain in November or we will all be sorry. Bush, Pickens, McCain, and everyone else from whom I have heard so far on the subject of "energy independence" believes that it will take about ten years to bring their plan(s) to fruition. Oil, plus new refineries, would be a sure bet in ten years; ditto more nuclear power; ditto more coal. However, while wind can be used immediately, solar is much more problematic. First, the average amount of sunshine everywhere on the globe is 12 hours per day, variable by season and latitude. So, to use that energy source on a 24/7 basis, there has to be a really cheap energy storage system. No one has found one. Perhaps electrolyzing water into hydrogen and oxygen? Multiple uses for both, but even with "free" sun power, this is not a cheap solution. Its a head scratcher; oil is still the most efficient energy source we have outside of nuclear. I guess it's alright to disagree with the President on this issue but if the Democrats are going to continue to object to every plan presented I don't think it's to much to ask for them to come up with some kind plan that sounds like it might have some chance of solving the energy problems. The main goal of Mr. Pickens’ plan is to reduce the outflow of dollars to pay for foreign oil. More domestic production of oil accomplishes that goal. For over 20 years mostly Democrats have been opposing more drilling with the argument that it won’t have any effect at the pump any time soon. That failed policy has gotten us into this mess and it’s time for change. Drill now and drill wherever there’s oil, and then do everything we can with wind, solar, nuclear, and electric powered transportation to permanently reduce oil consumption. Once OPEC countries see that we’re serious about reducing demand for their oil and about developing oil replacement technologies that we can export to the world, the price of oil will drop like a rock. The OPEC countries will maximize production in hopes that cheap oil will stop our efforts again. We just have to make sure we don’t fall into that trap again. I don't believe drilling is the answer, due to future generations eventually facing our own problems. I would say passing legislation for drilling would need to come with some very stringent efficiency standards from the automakers, along with the development of alternative renewable fuels such as hydrogen fuel cells and the use of plug in or solar hybrids. There needs to be a basis for beginning this process, by allowing drilling to commence and allowing the price of oil to remain stagnant. New technologies will be developed with the hope that newer energy storage will be a part of the development. Another comment about renewable fuels: biofuels are not the answer, our food supply will be diminished by the massive demand of energy and our economy will be hurting with the increasing food prices (we are already seeing this). We will lose our country because of clueless liberals long before there is any impact at all of "global warming" [now called "climate change" because the idots can't agree whether the earth is really cooling or warming-in geoligical terms]. We humans will use every last drop of oil as long as it is the cheapest form of energy. You cannot stop the use of oil until the cheaper alternative is a reality. Period. One point of disagreement with the President's position, however, is that more domestic oil probably won't lead to lower costs because the market will dictate where the oil goes (unless nationalized). So, the highest bidder will still get our domestic oil in a free market. I see that some are posting the same tired arguments against drilling. Well do yourself a favor and get the facts. More domestic production is not the full answer, nor the final answer, but it’s is an important part of the answer. Why, because even if alternative energy is so successful that the U.S. doesn’t need much oil by 2025, much of the world will still need it. Our domestic production can then reverse the flow of wealth back into the US. our continued dependance on oil domestic or not has to be a bigger conspiracy than the kennedy assasination we cannot drill our way out of this problem. and i dont understand why people dont realize our planet is an oasis and should be protected. What's the point of all these discussions? It's actions that count! Also the media still reports on things as though their job was just to satisfying a 'curiosity' or demand for daily info and/or 'infotainment'. Shouldn't the media also follow up on prior stories and its readers comments to these stories, by presenting those in power with an opportunity to respond to the comments and postings, and then follow up AGAIN AND AGAIN, until some really good and 'definitive' answers are provided by those in control of things (which includes politicians, financiers, entrepreneurs, scientists, business people, etc.). Otherwise, all the chatter and opinions of even a million people is – just that – pretty useless chatter! Actually, this proves that the internet hasn't made all that much difference in how things get done, either in Washington or elsewhere. Those with the real power to change things (like Pikens – for better or worse) aren't the ones blogging or forever opining (or even reporting) – they're the the ones that were here before the internet and will always be with us. We don't live in a true democracy, even with the internet. We can only freely hope and complain. That's why even the Chinese aren't that afraid of the interent anymore, since the true power will stay with those who know how to get it and hold on to it (like Putin). The most frustrating part of the energy debate is the all or nothing approach that some politicians take. Because opening up offshore drilling in the US will not give an immediate result, some take it off the tablle. This attitude misses the point that we and the generations to come are in this for the long haul. We need to do the right thing now as the petroleum-based economy and our way of living will be around for a long time no matter how the energy debate ends up. Yes alternate sources of energy are needed but we can and should follow a path that ensures our petroleum supply for as long as possible while we bring on alternate and renewable approaches to sustainable energy. We have enough capability to do both. Companies that know how to drill for oil will do it, while others that know how to generate energy from alternate routes will do it their way. In the long run, we will all be winners if we allow the market forces to provide the winners and losers. The oil economy is a dinosaur. Maybe it’s not extinct yet, but it probably will be in some readers' lifetime. Opening drilling offshore is only a last gasp at maintaining the tsunami that is the momentum of the oil industry in this country. We need to break this momentum somehow. Grabbing at straws that perpetuate a limited resource in a global community of ever-increasing demand is just not the way to go. Once again, I'm with T. Boone here – we're not going to be able to drill our way out of this problem. We need to develop a national plan in the same manner T. Boone has, but with a more diverse look at potential sources of power. The installed price of solar technology continues to fall, and would fall even quicker and more substantively with strong federal, state, and local support. The U.S. uses about 100 quad of Btu per year (a quad is 10 to the 15th power). We receive about 500 quad/year just in New York State. And that is energy from a source that will not run out for a long, long time, nor does its use put noxious gases into our atmosphere. The country needs a comprehensive energy plan in the worst way. It is my strident hope that whoever wins the White House will have such a plan on their agenda early on, as much for the good of our economy as for national defense and security reasons. The time is now. What are the democrats going to say if Obama gets elected and the gas prices continue to rise . They took control of Congress promising to lower the gas price. Since then the price has almost doubled and I have yet to see them even try to do anything to lower it. Most of them cry for windfall taxes on oil companies and really do not see how the government taking my money away from the oil companies to spend on some pet project solves my problem of paying $4.50 a gallon for gas. There is one argument for offshore oil drilling that I have not heard as yet. That is, we know there is oil out there. We can even estimate how much we can take out of the ground. What we do not know is where the next "monster" field will be. There is a finite possibility that given the freedom to explore in all of our territory, some new large finds are possible. To say that we have found all the big deposits is like saying that all the inventions that hare possible have been made as one patent official said in the late 1800s. I AGREE WITH MR. BOONES ABOUT MAKING ENERGY THROUGH THE USE OF WIND FARMS. THAT ALONE MAY BE ENOUGH FOR HIM TO MAKE PROFITS ON HIS INVESTMENTS...AS FOR THE NATURAL GAS...I DISAGREE. I USED TO GIVE SPEECHES CITING THE REASONS WHY WE SHOULD SWITCH TO NATURAL GAS...AFTER ALL IT IS THE CLEANEST BURNING HYDROCARBON. BUT I STILL DON'T SEE WHY AMERICANS ARE STILL "HELL-BENT" ON USING HYDROCARBONS TO POWER ANYTHING AT ALL. IT SEEMS TO ME THAT SMALLER PROFIT MARGINS IN THE SHORT RUN (INITIAL INVESTMENT IN RENEWABLE ENERGY) ARE GOING TO YIELD HUGE PROFITS IN THE LONG RUN (FREE ENERGY MINUS MAINTENANCE). WE SEEM TO HAVE A CASE OF PROCRASTINATION WHEN WE SHOULD BE ASKING OURSELVES WHERE WE WANT TO GO AS A NATION AND AS A SPECIES...IT SEEMS INEVITABLE THAT THE INTERNAL COMBUSTION ENGINE JOINS THE STEAM ENGINE IN MUSEUMS, AND PROPANE AND NATURAL GAS FOLLOW ALONG WITH WOOD AND COAL FOR HEATING...OUR FUTURE IS WHEN INEVITABILITY AND PROCRASTINATION COLLIDE...WHICH ONE DO YOU THINK WILL WIN? Well, I know a lot of people, especially environmentalists, don't want to hear this but it's a cold, hard fact. We have to use energy to provide cleaner energy sources. And we're still at the mercy of foreign oil. We need reusable energy sources like wind, solar, tidal, etc, but it's not going to come next week, nor in a year, ten years, probably even 20 years until it's widely used. Which means we still need oil. Our entire infrastructure is based on oil. To make a transition like that will require trillions of dollars, dozens of years, and even then, some oil will still be needed. Right now, no, we can not get the oil off the coast nor under the Green Valley area by next week, but we can at least start surveying it and perhaps in 5 years or maybe 10 years, we will have a stable oil supply without being fleced by OPEC. And by that time, gas will probably be what? $8 a gallon? By current rates, having a stable oil supply underway, or on the way, that will help control oil and gas prices because everyone else will be thinking "Hey, they're going to cut us off from our major/only income. We need to fix our prices and quick." On top of that, we need more refineries. Yes, all of the fossil fuels put out emissions. During the Triassic Period and Jurassic Period, there was more greenhouse gas in the atmosphere than there is currently. So were the dinosaurs bad creatures for having a "worse" world? Yes, fossil fuels and extracting them can cause massive environmental disasters. The Scandinavian countries drilling for oil on the North Shelf and off the rest of their coastal areas have had little to no accidents resulting in major oil spills. And we, the United States, taught them how to do it. They just learned to do it better. So we can learn from their statistics. So what's the major issue with environmentalists? Drill for oil. Make it cheaper. Make a solution to the problem, don't just promise permanent solutions decades away from being done. To put it simply, you need to stop the bleeding first before you can save a person's life. Stop the problem instead of letting it continue to get worse. "Not only does Pickens’ firm, BP capital, have significant investments in natural gas, but last June he announced plans to build the world’s largest wind farm in west Texas, capable of producing 4,000 megawatts of electricity. The federal government subsidizes wind farm operators with a tax credit worth 1.9 cents per kilowatt hour — potentially making for a tidy annual taxpayer gift to Pickens based on his anticipated capacity. But all is not well in Wind Subsidy-land." There is a lot more at the Web site. We're bound to run out of oil some day. We might as well get started on wind/solar/geothermal/nuclear now while we have the oil to power the projects. Indeed, I'm surprised that we still have gas-burning cars at this late date. I'm on the "Manhattan Project" bandwagon – but it (like the Apollo project) requires a government led intiaitive – a ten year, date certain commitment, funded by a $.25/gas tax (that sunsets) – to develop an alternative fuel source for our transportation and eliminate our use of oil for that purpose, in my mind. Many comments have spelled out the positives for such a plan, especially the value of rallying around a common goal – nothing brings out the best and the brightest in America than a challenge – and our collective pshyche needs such a goal right now. Relying on the marketplace to come up with the answers continues a too slow progression to the inevitable alternatives – with continued unsustainable losses of American lives, money and credibility. Bush stated today in his news conference that we haven't opened up a new refinerey in 30 years – so even if we find more domestic oil, what do we do with it? Let's get the pain behind us as soon as possible....yet neither candidate to date offers the dynamic leadership this issue requires. Ya know there is only one true way to reduce the use of oil and energy............STOP MAKING PEOPLE ! Tax credits may start an industry, but prices are the only thing to keep it there. I personnally hate the $4/gal gas pump, but it's spurring destructive innovation. What history has shown (twice now since the 70's) is that the present price surge will fall, if only for a while. We need a policy floor for consumers to ensure that all the investment that is starting to flow now, doesn't end up bankrupting the innovators when this surge pulls back. If I'm wrong, a floor is just something you look at from above, otherwise it would ensure prices (not credits) are in a range that investment money keeps flowing into. in the mean time....think of how much oil we would park if we replaced the biggest SUV's with small more efficient engines (or diesel). By the way, where are the politician yelling about car-pooling, mass transit, or other easy mileage drops. I'm confused by the silence from the establishment, except for blame. Mr. pickens and many others are right. We need to support wind and bio generation projects as well as recover natural gas from the oceans floor. Methane is far worse on our enviroment than Co2. We need to recover at land fills, farms, food plants, and sewage treatment plants and turn it into energy it to save our enviroment. Part of the high price of oil is due to the weak dollar. Right now, today – we need oil. When we purchase it from others; we are further weakening the dollar. The weaker the dollar, the more oil costs. It’s a vicious circle. Should we increase domestic production; the dollar would be strengthened, and would have more buying power in the world. Increasing domestic production would also add to total world production (increased supply) which would put downward pressure on oil contracts (speculators). In fact, just the idea that we might increase domestic production is having a positive effect. Our goals should be to develop wind, solar, bio-fuels, hydrogen, geothermal, nuclear, and other alternative sources of energy. But fossil fuels are going to provide a major part of our energy for quite awhile. So we also need to look at better, cleaner and safer ways to use coal, oil, oil shale, natural gas, and methane. None of this is going to happen overnight; and we will need both alternative and traditional sources of energy for some time. And at some point in the future, we may be able to wean ourselves off of fossil fuels completely. But I am afraid that time is very far off. jeffrey I agree with you about the silence on car pooling and mass transit. even this forum is stacked with a bunch of entitled americans still waiting for someone else to fix the problem. we won't really fix the conservation problem until the tables turn and we see ideas like when it becomes very unpopular to be seen in your big SUV. people all want to complain about the price of gas, but they continue to drive to work alone because car pooling is inconvenient or they might have to adjust their schedule a bit. already did all this ? then ask your neighbor to do it too. electric autos are the bane of the auto and energy entities. the only direct competition to energy companies is solar. a home owner can competitively generate solar power without the approx. 60% delivery penalty that energy distributors must endure. Electric autos (with indefinite life hydrogen cells as batteries) are much cheaper to produce, have much longer live expectancies, much lower maintenance, and lower part replacement costs. Research on full bandwidth solar cells is nearly nonexistent. (photons exist everywhere above absolute zero, not just visible light bandwidths). anybody see a pattern here? I personally cant change the world but huge percentage of us could. Tomorrow newer comes as foretold by the sages. Oil and gasoline are extreme in price, pollution, and performance. Forced to switch, the Manna from Heaven is disappearing. Coal is cheapest, liquefying, electrifying, keep us going for a century. Wind, Solar, and Tidal, as backup, if inexpensive. What is the problem ? Commies dressed as Greenies. Exploring for and testing for oil/gas off the continental shelf would be nice knowlege to have. ALL off-shore drilling ships are 100% committed for the next five (5) years (CNN, May June?). Testing and production are therefore 5 to 10 years out, at best. Who would the ban-lift benefit? Probably Bush's friends (Exxon-Mobil, Shell,etc., etc). The same "friends" who now have lucrative contracts with the Iraq government for Iraq oil production. Oil / gas are non-renewable resources. I know our Administration (both Republican and Democrat) doesn't like common sense, but my feeling is it is long past the time when we need to put our resources into solar / wind / geo-thermal / clean nuclear power. Our "government" continues to fail it's people on education, health care, elder care, the economy and now future energy sources. Isn't it time for another Revolution? I agree that we cannot drill our way out of the crisis. I also agree that using up foodstuffs and arable land and potable water is not the answer. Using all of the available innovative technologies can solve the problem AND mitigate global warming at the same time. Wind, solar, hydro, geothermal, and tidal can be harnessed to generate electricity. Coal fired generating plants are still the most economic way to produce electricity BUT FOR putting out massive amounts of greenhouse gasses. Nuclear power plants are "non-polluting" EXCEPT FOR the devastating environmental issues at the mining milling, and disposal stages of the cycle. The above can provide the electric power we need but does not address the liquid transportation fuels that are needed. There has been little mainstream media coverage - and no political comment - of the R&D being done on the use of algae cultivation to produce chemical feedstock that can be processed into biofuels, including diesel, ethanol , jetfuel, hydogen, and others with a production volume substantially more efficient than using "traditional" sources. There are a number of university and small start-up programs that are developing techniques for using the CO2 and other "wastes" from flue gasses and sewage treatrments and elsewhere along with non-potable water and sunlight under controlled condiions that are proposed to produce all the liquid fuels required while using productively the main cause of global warming. It seems to me that all it takes is the National Will to invest in the commercialization of this new technology. In the 1970's we had the technology to launch the Voyager space probes which are now leaving the solar system, and we had the cability to reach the moon. Today we have humans living in space on the International space station, and we're exploring Mars and the other planets. Not to mention all of the countly advancements in science and technolgy we've achieved. We have the technology to create cars and other forms of transportation that do not need to use oil. And we have the technology and innovative capabilites to develope sources of energy to power them. Electric cars that meet the commuting requirements of probably 90% of the population are in reach. It would take something of the magnitude of the Interstate Highway project to fully develop the technology for electric cars and then replace the millions of cars that everyone drives with new ones. We could do it, its just a matter of getting the oil companies that control the energy supply to invest their vast fortunes in that type of initiative. We wouldn't need oil anymore, which I could understand an oil company executive being worried about not being able to sell oil anymore. But if we stop thinking in terms of oil, and realize that we are really talking about energy, the oil companies have the opprotunity and the resources to convert their business to things like wind, solar, clean coal and other forms of alternative energy. Not using oil anymore would go a long way in solving the problems in the middle east too. If we don't need their oil anymore, there's no reason for the USA to wage war to try to secure the supply. The worst problem at this time with electric cars is that energy storage is not very efficient yet. The new style of lithium-ion batteries which is still in the research stage, which will allow complete recharge in five minutes should change that in the near future. However,after enough of these cars will have been sold, we will find that we are unable to produce sufficient electricity. Electricity supply even now is often a problem. Plans for more electricity generation should be started immediately. If that is neglected now we'll simply swap one problem for another. Unfortunately we only usually notice problems when they hit us broadside. Anticipating these is not exactly our strong suit. Before falling in love with Pickens you need to tak a look at what he is doing with water from the Ogallala aquifer. He wants to basically pump it dry in the process of supplying water to a big city. When he says he doesn't need any more money that may be true, but he certainly wants more and is willing to destroy the aquifer in order to further line his pockets. Our current infrastructure is all based on liquid fuel, particularly oil based fuels (primarily transportation). Any change from this existing structure will take years, literally! The oil companies are some of the most fiscally responsible organizations in the world. So it is no surprize that the esxisting oil leases are not being exploited. The existing oil lease property is worthless. If it actually had value, the oil companies would be exploiting it. It has no value because the costs can not be justified. Obviously the fiscally irresponsible congress cant understand this idea! Thus, it is an obvious realization that the additional offshore areas need to be opened because this will give more opportunity for oil companies to recoup their costs as opposed to being fiscally irresponsible (oil companies would go bankrupt if they are fiscally irresponsible and no one would be able to drive!). Ok, that is 1 part of the solution. The other part is to do what Pickens suggests. The government needs to put an additional tax or tarriff on imported petroleum (not domestic supply!) to incentivize the use of domestic energy systems such as coal, natural gas, domestic oil, nuclear, solar, geothermal etc. This tax will be multiplied many times over as the u.s. keeps money in the u.s. instead of sending this wealth overseas. In addition, the republicans and dumbocrats need to agree on providing some tax benefits or incentives to get a new infrastructure established that we can use to help meet environmental goals & improved efficiency goals. This is a basic energy plan. I believe that an agreement to permit some offshore drilling will produce some downward pressure on oil futures, which will lower prices today and in the medium term. The long term is another matter – clearly demand is going to continue to climb and there will be little ability to increase supply enough, leading to escalating prices. So T.Boone is correct on that point. 1: drilling today, it is said, will not decrease fuel costs (heating or other) for 10 years if we start drilling today. Creating centralized power plants is extremely inefficient. Converting DC current to AC and piping it long distances only to have our appliances convert it back down to a usable charge is very dumb. The only benefit is that a greedy individual gets to charge everyone for the power. Why don't we invest money in the form of incentives so that each building supplies all or a portion of it's power? This model is already working in Germany and Denmark (not very sunny places). DC appliances exist and this type of current comes straight from the solar panel. It is far more efficient, but there's the old problem of the greedy guy who wants to charge you for it. How about we create manufacturing jobs for devices that make the energy and create an economy around charging for the devices and their maintenance rather than the energy itself? Ask the greedy guys in charge WHY! Any oil found off our shores and beaches would go into the world market, you think all the oil out of Alaska comes directly to us? We exchange the sunny vista off Miami or any other beach for oil rigs and potential spills to feed a voracious world market while killing our tourist industry, our environment and who knows what else. How does this alleviate our transportation problem? Do we put the people in the tourist industry out of work so their portion is available for the rest of us? It’s our infrastructure that needs planning something that hasn’t been done since the 60’s. Mass Transit, charging stations, park and ride areas, bike ways, etc all need to be looked at for getting from point A to point B without or very little oil. Lets be realistic. Every discussion of energy policy needs to include the economic and environmental consequences. Alternative energy is going to take time to develop. Until that day comes, we still have to survive. The question is, do we send our dollars and jobs to other countries; or do we produce more of our energy domestically? I would love to see a steel mill that can run on 100% solar. We aren't there yet. Like it or not, oil and other fossil fuels are going to be around for foreseeable future. To get off of fossil fuels; we will need a mix of alternative energy sources. The in no single answer. And until we can develop the technologies , the infrastructures, and get them down to reasonable costs; we will still be using fossil fuels. This can be mitigated by increased conservation; but realistically, we are going to be using traditional energy sources for quite awhile. The most crucial thing we need today is a plan – a road map to clean energy independence. And that requires leadership. Leadership to map a course from dependence on fossil fuels to energy independence using non-polluting sources. However, what we get is partisan posturing and industry interference. Until we elect people that care more about our future than their own, we screwed. Most politicians listen to the fat-cat lobbyist instead of the people. We need a Manhattan or Apollo type project with a realistic timetable and clear goals. I am afraid I don't see anyone in either party that can do this. They will continue hold committee hearings, give speeches, and make promises, but do nothing. Eventually, some hodge-podge, be-all, please-all, loaded with pork plan will evolve that is destined for delays, cost-overruns, and ultimately – failure. This is all our "leaders" are capable of these days. This is one reason why we have both a president and a Congress with the lowest approval ratings in history. I don't agree with everything that Mr. Pickens says, and I don't think he has the complete answer; but at least he has a plan, and is doing something. is out there, it's just very expensive. позвала подружку пойти погулять в парк вместо двух последних уроков. все точно еще учительница опоздает на урок минут на 20-30 и зачем сидеть в пыльном классе. подружка не согласилась. да ладно, учебник то можно и дома прочитать – учительница со второго урока приходит на урок, открывает учебник и начинает читать механическим голосом (как робот). Если спросить ее что – то,Ю что почему-то она не хочет объяснять. Вырастите – все сами возьмете в толк. Так вот состыкавалась такая пара и я решила свинтить с этих уроков. говорю не хочешь в парк, пойдем в баскин-роббинс, мороженного поедим разного, посплетничаем, я угощаю. че в школе плесенью покрываться? подружка опять не в какую. говорю ты чего такая скучная, весь учебный год еще впереди, успеем еще научится всему. Подружка мне говорит вот мол классная родителям позвонит, и т. д. и т. п. Я ей тебя подруга реально попрасила, с тобой и так в классе общаюсь только я одна, с тобой ходить неудобно, общаться скучно, только контроши у тебя скатывать. Она: значит мы дружим только из-за контрольных? я залепила ей пощечину. она заревела и пошла прочь. яхотела догнать ее и извиниться, подружка матом послала меня. сижу и думаю стоит мириться или же нет. и в случае в случае если да, то как. I pologise, but, in my opinion, you commit an error. Let's discuss. Write to me in PM, we will talk. I will just be truthful and tell you that I didn't fully comprehend some of these arguments but you are an amazing writer. I named my pet gold fish after your blog. I discovered your articles via Blog while searching for a related topic, your post came up and I am happy it did You really appear to understand a ton about this subject. I kind of find this funny for some weird reason. What's wrong with electric cars?